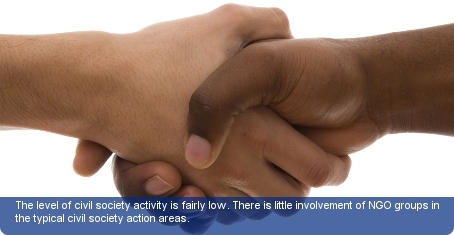 The level of civil society activity is fairly low. There is little involvement of NGO groups in the typical civil society action areas of human rights, education, health and gender rights. Much of the activities of non-governmental organisations are in environmental conservation. The Salvation Army, Red Cross and Amnesty International are some of the primary international NGOs operating in St Kitts and Nevis. Mothers’ Union, an international Christian charity supports multiple projects for the elderly, children and prison inmates. The country’s environmental affairs have for a long time been managed and funded by a Government-NGO partnership. Current active NGO participants in this arena include the Nevis Historical and Conservation Society, the St. Kitts Heritage Society, Business and Professional Women (BPW) and classic civil society actors such as the Lions Club and the Rotary Club. Associated with the labour party and International Trade Union Confederation, the St Kitts Workers’ League is the country’s major workers’ labour organisation. The law allows police, civil servants and members of other organisations to create associations which serve as unions.